The influence of growing up in an airline family has different effects on different people. For me, it became apparent from an early age that I wanted to be a pilot, like my dad. After college and active duty in the U.S. Air Force, my brother Bill hired on as a pilot with TWA, when I was 14. Later, brother Bob, back from the Navy, got his college degree and held various positions on the ground with American, Golden West and a few travel agencies. 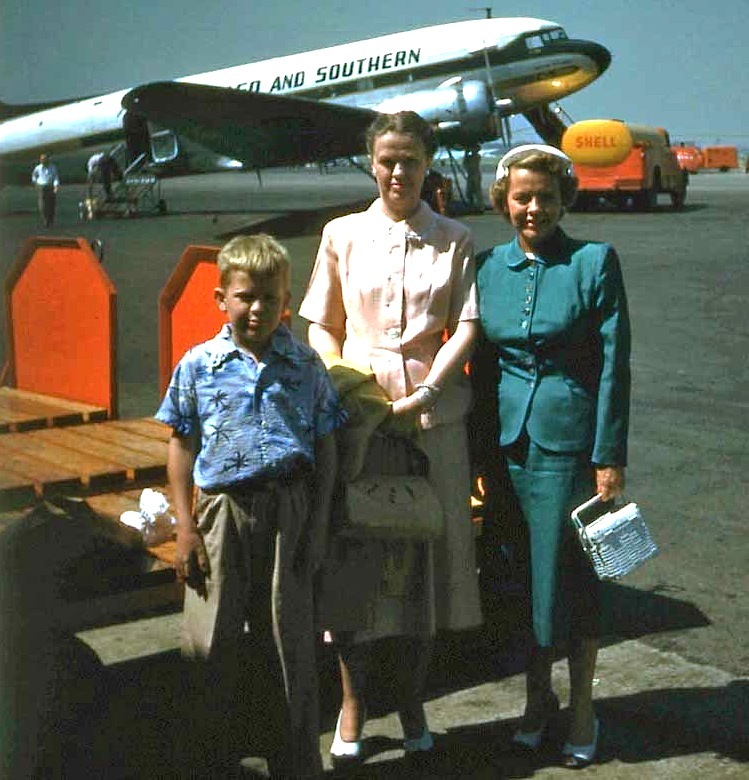 That’s me at Chicago-Midway in July 1952, with Mom (center) and cousin Johanne Brent, who was passing through on her way from Ohio to California. Moving from Chicago to a relatively small town, I found that La Jolla Jr.-Sr. High had barely more students in six grade levels than my freshman class, back east a year earlier. The milder weather was something you wrote about, to friends in the Midwest. I remember Mom insisting we have a picnic lunch on our first Christmas Day in California; I figured that was more for bragging rights than anything else. At first, we only had only one car, which required some planning between Mom’s schedule and Dad’s. At age 15, my bike provided most of the transportation I needed. I should insert here that my vision suddenly dropped from 20/20 to around 20/200 during my high school junior year; so much for becoming an airline pilot. I still remember Dad giving me some advice: If you can’t fly for a living, stay out of small airplanes. It was his way of telling me that you need to fly a lot in order to remain proficient and that’s an expensive proposition. Without going into great detail, I’ll admit to being an average student, at best. Part of it was because I much preferred hanging over an airport fence to studying. 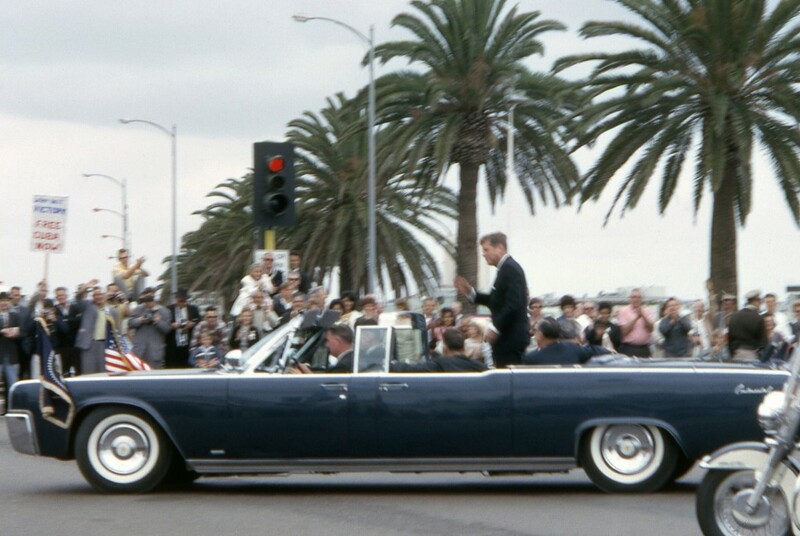 There was a bus that stopped three blocks from our house and, after a circuitous route through Pacific and Mission Beach, across Mission Bay and along the Convair plants, dropped me off right in front of San Diego’s Lindbergh Field terminal building. After befriending the San Diego Airport workers, I managed to get aboard airplanes on occasion; imagine trying that today! 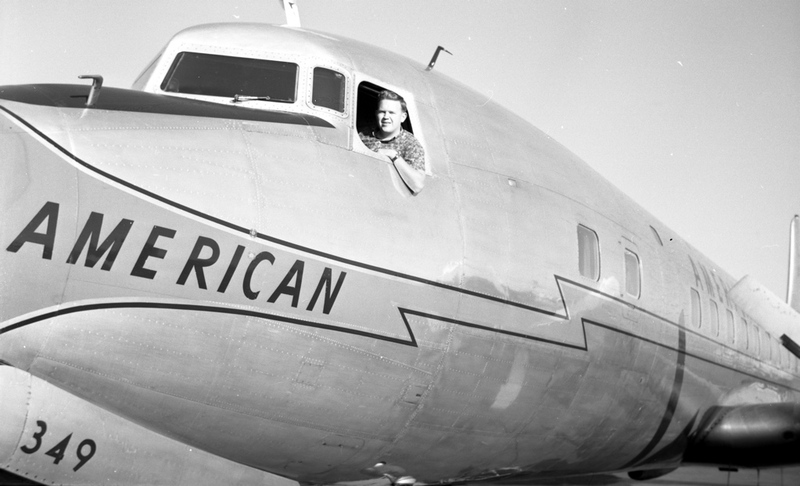 Fulfilling a fantasy, I sat in the left seat of this American DC-7B in 1962. The airport didn’t have an observation deck, nor did it need one. The baggage claim area and gates were open air and I found a few upstairs spots in the terminal building that afforded good views and chances for photography. I had, shortly before leaving Chicago, acquired a used Kodak Tourist camera, very possibly from brother Bill. Manufactured in the late 1940s, the type used 620mm film, which produced a negative measuring 2-1/4 by 3-1/4 inches. The camera had some pinholes in the bellows that resulted in occasional black dots on the negs, and dust was always a hassle, but after using a Brownie Hawkeye since childhood, it was a step up. Shooting pictures of airliners had become an obsession with me. I only took a few at Chicago Midway before moving west (http://jonproctor.net/early-aviation-photography/), but began in earnest at Lindbergh Field. I was terribly homesick for Chicago during my first few years in California. After Dad retired, l lost my passes on American Airlines, inasmuch as there had never had a company retiree with children under the age of 21, the normal cutoff for free travel. 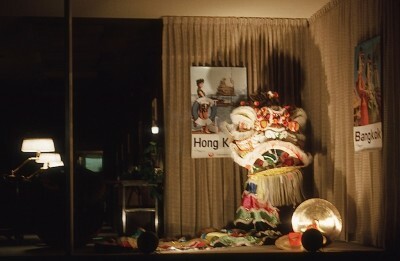 By 1959, I had nearly worn out my parents’ nerves, begging for a trip east. Dad spelled out what I needed to do: get a summer job and earn the money for a plane ticket. Flight 622 at Phoenix, being serviced for the onward leg to Chicago. Until then, I had not held down so much as a newspaper route. But I read in the newspaper want-ad section that busboys were being hired for summer work at the Del Charro Hotel on Torrey Pines Road in La Jolla. Originally opened by Texas oil tycoon Clint Merchison for use as his personal retreat, the hotel was a relatively small, pricey property with 50 rooms and eight adjoining cottages. Hollywood celebrities dropped in for lunch and dinner around the pool. I began earning $1.13 an hour plus a cut of the waiters’ tips, and picked up dirty dishes from the likes of Don Knotts and Hoagy Carmichael. FBI director J. Edgar Hoover spent two weeks there every summer, allegedly for his annual physical at Scripps Clinic, although he was also frequently seen at nearby Del Mar Racetrack, as were most of the guests. By the end of my first summer of work, I was still a bit short on the cost of a plane ticket, but was rewarded by my parents, who knew my heart was set on that return trip and made up the difference. 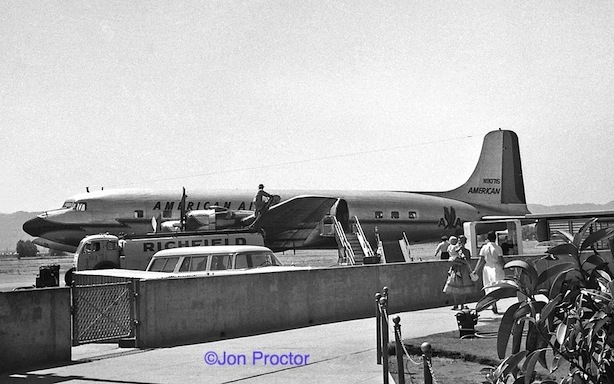 Nearly two years to the day after arriving from Chicago, I boarded American Flight 622 at Lindbergh Field, a DC-6 “Blue Ribbon Aircoach” bound for Midway Airport via Phoenix. On that morning, a marine layer enveloped the airport in fog. Fortunately, my flight, inbound from Los Angeles, had enough fuel to circle until the field reopened and it landed to pick up this eager teenager for his triumphant return to Chicago. It was a glorious trip for me, visiting all my school pals, who by now had driver’s licenses! I stayed around the corner from our old house, with Joe Tourtelot and his family. Fortunately, Joe enjoyed watching airplanes too, and we spent several days at both Midway as well as O’Hare. In fact, Joe and I repeated a trip we had taken for my 15th birthday two years earlier, and rode Chicago Helicopter Airways between the two fields, this time from Midway, via downtown Meigs Field, to O’Hare, where I got my first look at a Boeing 707. 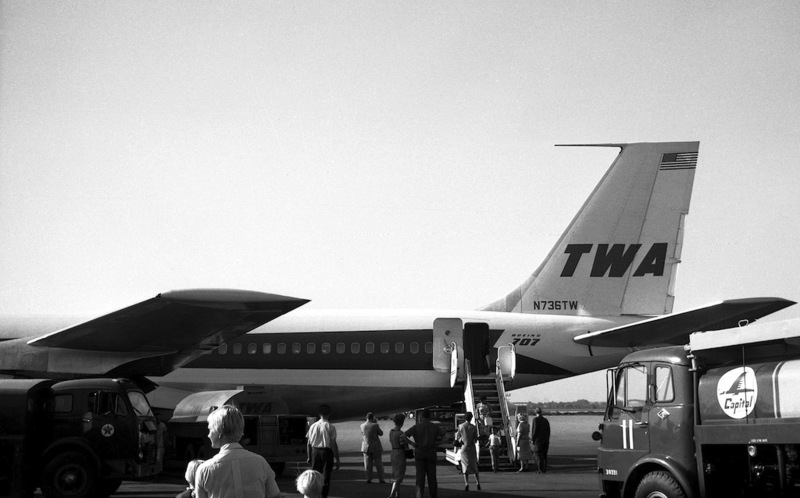 My return to San Diego came all too soon, but was made more exciting thanks to brother Bill, who paid the $7 “jet surcharge” required to ride TWA Flight 29 out to Los Angeles on 4-month-old 707. It was also the first time I had ever ridden an airline other than American; back then there wasn’t much in the way of interline pass privileges. Bill met me at LAX and we had lunch at Mike Lyman’s Flight Deck restaurant, overlooking the ramp. Later I rode a Western Air Lines DC-6B down the coast to San Diego. Trying to look cool with a ticket envelope in my breast pocket, I posed on the LAX ramp with a 1694A “Jetstream” during my TWA tour of LAX. During the winter months, I divided my spare time between the airport and working after school at Paul’s Sporting Goods, barely three blocks from my house in the La Jolla’s Bird Rock section, now known as Upper Hermosa. When the owner passed away, Joe Ginder purchased the store. How does he fit into my story? Well, Joe had been a station supervisor with TWA at LAX. Naturally, we hit it off, and I listened to many stories about his earlier career, cut short when he began wondering how long Howard Hughes’ airline would be around. Late paychecks and salary cuts convinced Joe and his dad to invest in a retail business. Joe later moved the business downtown and renamed it La Jolla Sporting Goods. 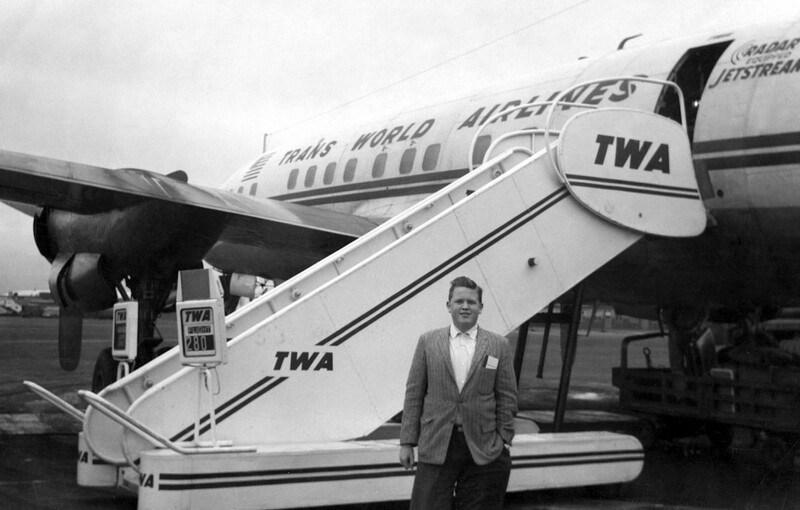 Joe hooked me up with John Kuzma, a Passenger Relations Representative (PRR) with TWA at Los Angeles on my first trip back to LAX in December 1959. I got a cook’s tour of TWA’s terminal space on Avion Drive, walked the gates with John and even toured a 1649A “Jetstream,” last of the Constellation models. Another highlight was the opportunity to photograph Desi Arnez on arrival from the East Coast. The roundtrip fare to Los Angeles was only $12 on PSA. 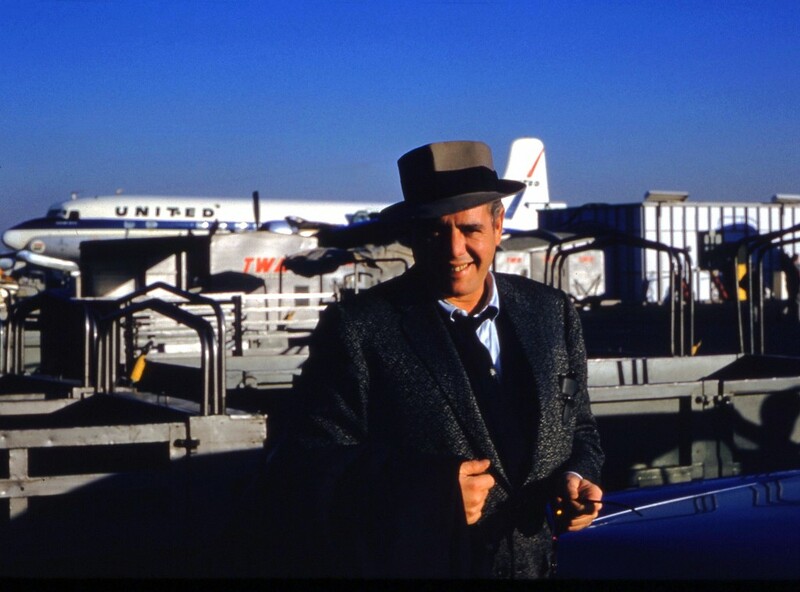 On this trip, I got my first Electra northbound, splurging on a first-class United DC-7 return ride. It was just a daytrip but I had a great time, again spending most of it at the airport. Brother Bill Proctor and his wife, Ann, met me for lunch and more touring around LAX. 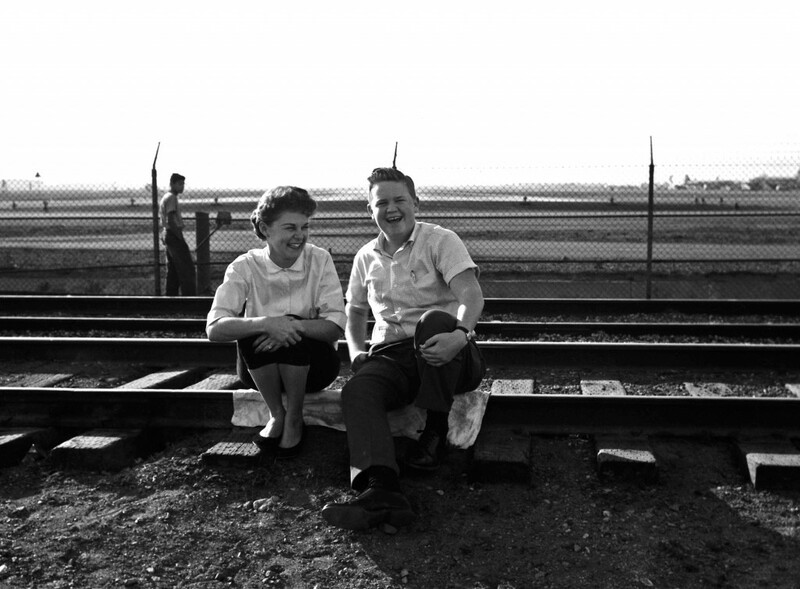 Ann Proctor and I sat on the railroad tracks watching airliners come and go on the 25 Runways at LAX; what fun! The closest I ever got to Dad’s razor strap was in early 1960, when I wrote a letter to American President C.R. Smith, asking him why children of retired employees were not allowed a pass allotment. I think Dad was secretly proud of me for making the effort, but felt embarrassed that his son was bothering the head of a big company. However, my effort paid off, and soon I again became eligible for free travel. 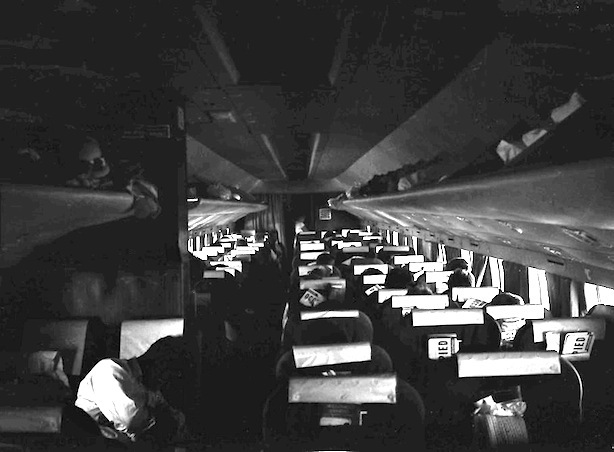 That summer I worked again at the Del Charro, having been elevated to the position of “salad man,” with my earnings instead becoming spending money during another trip back to Chicago, this time including a first-class 707 ride from LAX to O’Hare. I went on to college a year later, at San Diego State College, where I lasted two semesters and flunked out. I won’t blame it all on time on the airport, but let me just say my mind wasn’t into studying much beyond aviation; I did get good grades in Meteorology! Mom and Dad were disappointed and marched me up to Palomar Junior College in San Marcos, far from Lindbergh Field. Living in a rented room – the school had no on-campus housing – I put my nose to the grindstone and after three semesters, received my AA degree. I did well enough with my grades to pull the required, overall 2.0 average, including all those Ds and Fs from San Diego State. I should add that it was something like a 2.0001 average; one lower grade that last semester would have resulted in another tour to achieve the minimum necessary for graduation. I worked one more summer at La Jolla Travel, but still longed for a full-time career with an airline.In addition to inserting endless revisions to the various tariffs and writing an occasional ticket, I helped when the Greyhound bus came through; the agency had a contract to sell tickets and provide a few chairs for customers waiting to board, en route to Los Angeles. In addition, I took advantage of company stationery to write the various airlines and aircraft manufacturers, asking for airplane pictures. It allowed me to build a rather impressive collection. My only regret is not having kept timetables and outdated Official Airline Guides. Examples from that time period command handsome prices today at memorabilia shows. After graduating from Palomar Junior College in January 1963, I took the spring semester off before going on to a four-year school. Pacific Southwest Airlines (PSA) was consolidating its four reservations offices into one at San Diego. Joe Ginder knew Alex Davidson, who was in charge of the new reservations department and with a phone call from Joe, I got my foot in the door. I was hired in mid-February as a reservationist, and began work in March, at the princely salary of $300 a month and unlimited passes. This picture, from the December 1987 PSA Magazine, shows the San Diego res office during my tenure in 1963. Northbound flight numbers were on the left board, and southbound on the right. A row of lights, between the boards, lit up when calls were waiting, at which time all hands grabbed headsets and answered the phones. PSA had just removed its last DC-4s from service and transitioned to an all-Lockheed 188 Electra fleet; the last of six arrived at the airline about the same time I did. I now regret having never gotten a DC-4 ride, as such an easy opportunity did not present itself again. But I sure got my money’s worth out of that unlimited pass policy, albeit over a limited route map. At the time, PSA only served San Diego, Los Angeles, Burbank and San Francisco. The service charge for a trip up to LAX or BUR was $1, or $3 all the way to SFO. 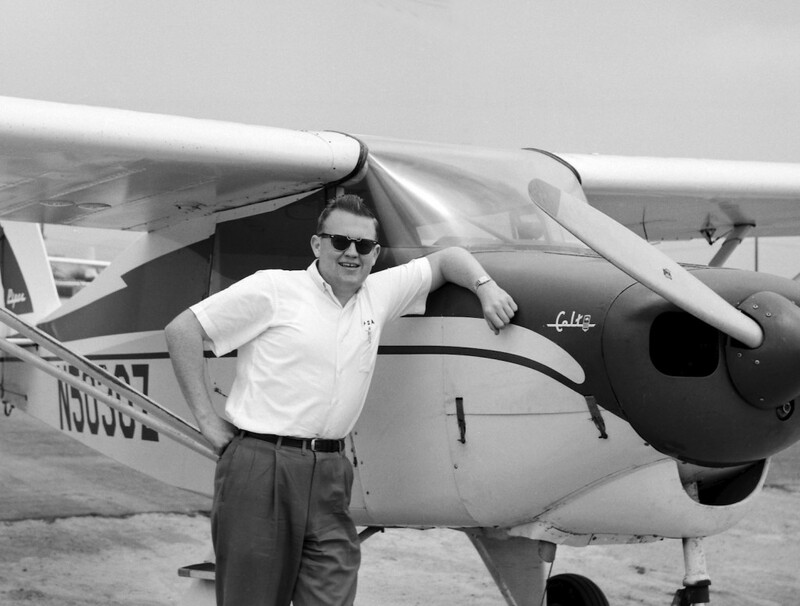 I‘m wearing my PSA shirt and pants in this June 16, 1963 photo taken at Palomar-Carlsbad Airport. My long-time pal Sam Givens and I were doing some local flying. I must have been going to or coming from work. A large board displayed all the flight numbers for the following 30 days, in white letters. As the flights filled up, the white letters were replaced with red ones. 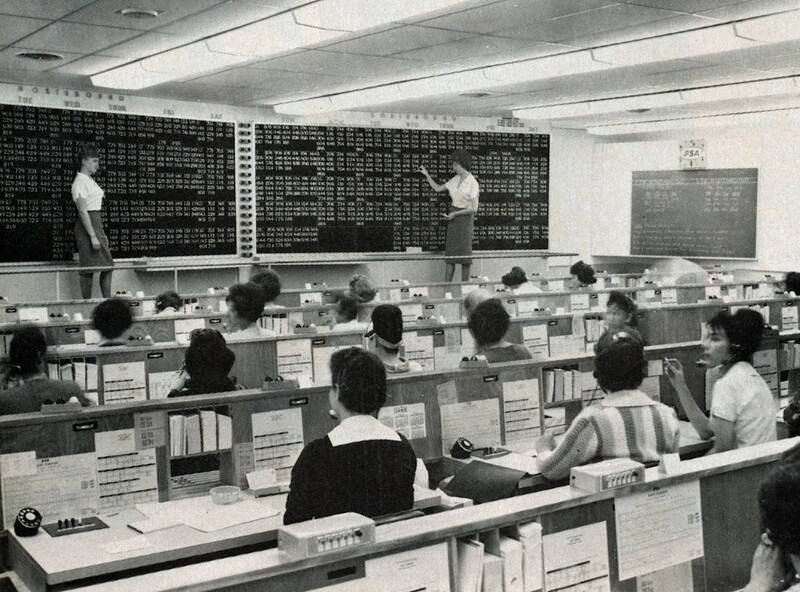 Phone reservation information was written out on file-size cards and sent down a conveyor belt to the records section. In 1963, PSA was still a small, close-knit company. President J. Floyd Andrews’ office was only a few feet from reservations, and his door was always open. I spoke to him about transferring to Burbank, in preparation for my return to school, at San Fernando Valley State College (now Cal State Northridge), a short drive from the Burbank Airport. “Andy,” as they called him, suggested I instead concentrate on my studies; there would always be employment opportunities with PSA after graduation. So I left my first airline job in September 1963 and moved into a small farmhouse in San Fernando, rooming with my high school pal, Charlie Fitzgerald, who was a year ahead of me in college. But shortly before getting there, an event changed my life. At a going-away party in my honor, and while dancing (“The Twist”), with a snoot full of booze and much enthusiasm, I rocked when I should have rolled, and tore the ligaments in my left knee, going down like a sack of concrete. In the process, I sheered off a piece of bone shaped like a sand dollar. The next morning, Dad carted me to a orthopedist, who sucked nearly a half-pint of blood out of the joint and strapped my knee with heavy tape to let the bone chip fuse back into place. A week later, off I went back to college on crutches. It only took about a month for the bone chip to break loose, effectively locking my knee joint. A week later, I had dropped out of school and was in Scripps Hospital in La Jolla, for corrective surgery to remove the pesky chip. Later in life, that injury would disqualify me from active duty in the military, at a time when fellows my age were being drafted and sent to Vietnam. They say everything happens for a reason; perhaps there was a reason here. Who knows? Alex Davidson was kind enough to put me back on the PSA payroll while I waited for spring semester to begin back up in Northridge. My first day returning to work is easy to remember: November 23, 1963. Everyone in the reservations office was wearing black, following the assassination of President Kennedy the day before. Knowing that I would return to school shortly, my supervisors in res shuttled me around the office as needed, attesting to my lame duck status, but I was grateful to have another bite at the PSA apple. At the time, aptitude tests were being offered to anyone in the company who was interested in learning the new computer systems being brought on-line. I took the test and apparently scored high as an offer was made to begin training, but I had committed to school and could not have looked Dad in the eye were I to break that promise I had made to him and Mom. In January 1964, I left employment at PSA for the last time and returned to school with that dream of an airline career still an uncompleted goal. I would not have to wait long.